A 41-year-old woman presented with one-year history of tinnitus and left otalgia, followed by the mentioned symptoms and demonstrated signs. 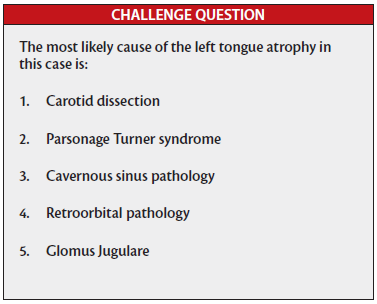 Find the answer and diagnosis in the next edition of Practical Neurology or online, posted along with the patient video at PracticalNeurology.com. Case selected from Dr. Shaibani’s Video Atlas of Neuromuscular Diseases, now available from Oxford University Press. Aziz Shaibani, MD, FACP, FAAN is Director of Nerve & Muscle Center of Texas and Clinical Associate Professor of Medicine at Baylor College of Medicine in Houston, TX. He is also Adjunct Professor of Neurology at Kansas University Medical Center in Kansas City, Kansas. Part 1: Untangling the complexity of dizziness and vertigo requires a careful history. Sleep disorders are a common symptom of traumatic brain injury and treating them is also part of promoting recovery. New research shows adult epilepsy patients report ADHD at higher rates than the general public. How does this affect seizure control? Sleep medicine’s newest addition has a novel mechanism and an undecided future. Long-term effects of AEDs on vascular risk factors often go under recognized. Here’s what you should know. Cognitive impairment after acute stroke is likely under-appreciated despite its impact.